June 17, 2013 - At the 2013 Paris Air Show, Bell Helicopter announced its return to the short light single (SLS) engine helicopter market with a new product designed to specifications based on the input of a customer advisory council. 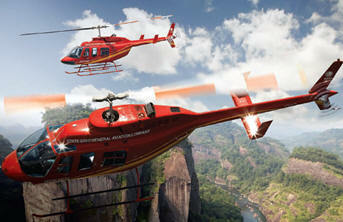 Bell Helicopter's new, five-seat entry-level aircraft is expected to complete its first flight in 2014 with certification to follow as quickly as possible. "Bell Helicopter is no stranger to the short light single market. We developed it nearly 50 years ago with the introduction of the Bell 206 JetRanger and are proud to have produced nearly 7,400 Bell 206 series aircraft since 1967 with over 4,400 remaining in service today," said John Garrison, president and CEO of Bell Helicopter. "However, we needed to create a new, modernized aircraft to meet requirements of five seat utility, training, private, and law enforcement operators." Bell Helicopter's new short light single engine helicopter will feature a high visibility, fully flat cabin floor with five forward-facing seats. It is designed to meet performance targets recommended by the customer advisory council, including a speed of 125 knots (232 km), a range of 360 to 420 nautical miles (667 km) and a useful load of 1,500 pounds (608 kg). "The SLS class is both extremely competitive and price sensitive, so we collaborated with customers to incorporate their mission needs in a high performance, high value helicopter at a very competitive price," Garrison added. The new aircraft will be powered by the Turbomeca Arrius 2R engine, which will offer the benchmark for performance and power, while improving safety and lowering pilot workload with Full Authority Digital Engine Control (FADEC). It will also meet IATA Stage 4 noise targets. The Arrius 2R engine delivers performance and power within the 450-550 shaft horsepower class, while improving safety and lowering pilot workload via a Full Authority Digital Engine Control (FADEC). The twin-module engine configuration is designed to reduce fuel consumption and lower the cost of operation. The Arrius 2R boasts proven reliability and 3,000 hours time between overhaul at service entry as well as Turbomeca's service and support excellence. "We are thrilled to be working with Turbomeca, the world's largest solely-dedicated helicopter engine manufacturer. As we worked with our customer advisory council to define requirements for the short light single aircraft, we knew we needed a team member that could deliver an effective and reliable engine to power their needs," said Garrison. Additional safety enhancing design features will reduce pilot workload, improve situational awareness and deliver superior auto rotation capabilities. The combination of capabilities, performance characteristics and value will be backed by Bell Helicopter's industry-leading service and support. The new helicopter is expected to achieve first flight in 2014.